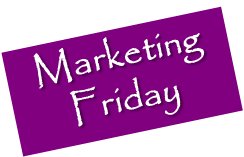 Here are five ideas which you can work on today, Marketing Friday, to get more business next week. Link into (and from!) complimentary sites (accountants, business services, industry organisations, your clients, business advice etc.). Google likes relevant site links. Beware of link farms with non-relevant links, you’ll get penalised if you are listed on these! Register for free with directories like yell.co.uk, Thompsons, Google Local etc. Create strategic partnerships with people targeting similar markets to you (e.g. if you are targeting small businesses try and link with an accountant or printer to double your contacts). Visit trade fairs / new business events. Create an “elevator” speech to tell people what you do in a couple of short sentences so you can effectively stick in their minds.